I teach in Puebla, Mexico. I've lived here six years and I teach Kundalini Yoga classes for children, seniors and people in general. Currently the Guru Ram Das center of Puebla, has a page on Facebook and I'm the director. On this site we publish recipes, tips, and information. 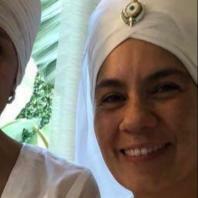 News of Guru Ram Das center and its teachers on www.kundaliniyogapuebla.com In Puebla, the community seeks to support each other. We do Langar 3 times a year, distributing food to those who have no resources.And do SGGS continuous readings 3 times a year. The center offers level 1 and level 2, with the support of my teacher Ravi Kaur Khalsa. This year I am supporting the "21 Stages of Meditation" in Mexico. I coordinate and support Level 1 in Oaxaca for three teacher trainers: Pritam Pal, Tarn Taran Kaur and Ravi Kaur. I like my job and I like to serve.